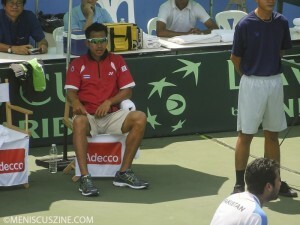 Between Michael Chang and Kei Nishikori, there was Paradorn Srichaphan. The Thai remains the best-ever player from his country, having won five ATP singles titles and achieved a career-high No. 9 ranking. The first Asian-born and -raised player to crack the Top 10, Srichaphan retired from the sport in 2010 following several injuries sustained in a motorbiking accident. Yuan-Kwan Chan: First of all, congratulations on making it a group higher to Group I. Can you talk about your experience as a Davis Cup captain versus playing for the team? Paradorn Srichaphan: Yes. Well, this is not my first time to be a captain on the Davis Cup team. Of course, I have played in the Davis Cup more than 20 times. I think where I can help the players and the team is from my experience; it’s always good to see a younger player to play for the country. 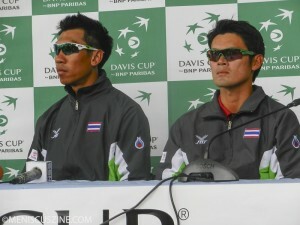 Today, I think, is a good day for our Thai Davis Cup team to get back to Zone Asia/Oceania Group I again. Can you talk about each of the players on the team and what strengths they bring to the squad? Well, this round is the final round and we have great, experienced players. Like, our No. 1 player, Danai Udomchoke, he’s been in the Top 100 in the ATP rankings. And we have a great doubles team: The twins, Sonchat [and] Sanchai Ratiwatana. That’s why we have really good players to play in this round. Of course, to play against Pakistan today: Aisam Qureshi, he’s playing. His ranking is No. 37 in the ATP world rankings in doubles. So, we had a tough opponent this round. But I think our players did well today. From Michael Chang winning the ’89 French to Kei Nishikori’s success last week [as a finalist at the 2014 U.S. Open], you were sort of in the middle of that. You made the Top 10 and the idea of an Asian-born male making it to the elite ranks of tennis has sort of come up again in the press. With your work here in Thailand and throughout Asia, do you see more Asian male tennis players coming up the ranks like the three of you who’ve reached the Top 10? Well, first of all, I’m really happy to see Kei Nishikori – [who], of course, is a Japanese player, but [from] our Asian continent – I’m really proud to see a great tennis player from Asia. And now he’s ranked in the Top 10. I think in the future we will see more. Of course, if you look back 10, 12 years ago, at that time I was still playing and I was ranked in the Top 10. You can see it’s taken quite some time to see another great Asian male player. But I really believe that in the future, every country in Southeast Asia or Asia will try to make more and more great Asian tennis players to play in the ATP circuit. Kei decided to leave Japan to develop his career. If I understand, you stayed here, pretty much, with your dad and your brother. What were the resources that were available to you when you were growing up as a player? And have those changed now? Well, I think the difference between Kei deciding to practice in the U.S.…it’s great, you know, because he [found] a coach that he likes, and [can] play much more difficult tennis and [find] more players to hit with. But, for me, I decided to stay in my country because my family is still here. I liked to play the tournaments and then come back home, even if it’s quite far to travel to Europe or the U.S. But both ways, I think, it’s good both ways. It really depends what the player likes to do; it’s not which way is the best. I think both ways work. Out of curiosity, how did you do it? Because the climate here is—right now, it’s supposed to be rainy season, but it’s almost like April [the hottest month in Thailand]. Well, yes, to play on tour, you’re almost traveling about 35 weeks a year, which is about eight months. You do not really spend time at home – even sometimes [during] rainy season in the country, most of the time I’m not here. So I was always traveling to play in tournaments. But it always feels good to come home, to see friends and to see family and refresh, and then go play tournaments again. Here at home, well, actually, since your retirement, has Thais’ interest in tennis continued to increase? Do you see more and more people picking up racquets? Yes, I would think so. I see a lot of young juniors playing tennis now. The big sport in Thailand is, of course, soccer. And [then] it can be golf and [then] it can be tennis. It really depends on the parents, what they want their kid to play. Here, at the Lawn Thai Tennis Association, we have a great facility, having a tennis court, more than 10 courts. We have a junior program here and all the parents can bring their kid to join the program. We’ll pick and we’ll see which kid has talent. I think this is how and this is where it starts. Do the kids live here on campus? It’s not like a campus, but it’s like a development program for juniors. We have almost every weekend a tournament, like Saturday, Sunday: 10 years old, 12 years old, 14 or 16, to have them play the tournaments to kind of get used to the [atmosphere]. At most we are playing a match, rather than just practicing for four weeks and then play a tournament one week. We try to have them play tournaments every week. Do you still run your own academies as well? I have my own academy in my hometown, in Khon Kaen, which is the Srichaphan Tennis Academy. It’s more like a tennis school. That because—that’s my hometown, and that’s why I put up six tennis courts in my home and have the kids [who are] more interested in playing tennis to come to join and play. But, if they’re good, we’ll send them to the capital, to Bangkok, to develop more skills. I see. What are some of the challenges in bringing up Thai tennis players here? Well, I think a challenge to build one great tennis player is really difficult because it’s a long-term commitment. It’s a long-term commitment for the coach, for myself and for the kid or the parents, too. It’s not like you win one match or win one tournament, and you’ll feel like you’re already the best; you always have to develop yourself because in tennis, you have to play against other players. It is a difficult job, but for me now, I’m just happy to be on court to see the players want to develop their games. You’ve been involved with many different types of activities since you retired. I’m trying to think, ‘Hmmm, what is he still doing?’ So, I’m just going to list them all. So, you don’t have a restaurant anymore? Will you ever get back into food? Well, you know, it’s something that I wanted to try to do. Not like try to do, just…I wanted to have one. You know, that’s why I started to have a restaurant. Actually, it was an Italian restaurant with Thai food, some manner of Thai food. It [ran] for almost a year and I found it was really difficult. You really have to spend time at the restaurant. What happened is, for the first three months, I’m staying there until like 1 or 2 in the morning every day because if I’m not there, then nobody wants to come. And so, that’s why it’s kind of, you know, I had to be there all the time. So, I decided…‘All right, just try to do something else.’ Yeah, a lot of things happening in life. You should have cloned yourself. Golf? Golf, yeah. For me, golf now is my—I don’t want to say it’s my priority, but it is quite half and half with tennis now. I actually want to make another—I don’t want to say history, but it is if I make it to being a professional golfer. I have a chance to play in tournaments now, golf tournaments, professional tournaments now in Thailand in the local tour. I’ve only played for four years now, but, you know, I really put time into it. Practice in the morning, practice in the afternoon. It’s just like the same routine as I play in tennis. Yeah, I have an expectation for myself in that, too. It seems like a lot of tennis players love golf. What is it about golf that you like compared to [tennis]? Well, golf, you can play it a long time. You can have a longer career. You can play the Senior Tour. For tennis, if you are starting to turn 30 or 32, 33, you feel like you’re a little slower than the 20-year-old player. But for golf, the more you play, the more you have experience. Becoming a monk is in the Thai culture. All the males in Thailand have to be a monk. A lot of politics. Yeah, I’m interested in everything, actually. That’s why I’m trying everything. It’s not like “trying” is what I’m saying, it’s like—it’s taking the opportunity to experience it. As you know, the political [situation] in Thailand is not really stable yet. You never know, maybe in the future I will try that again. Acting is really first thing after tennis I—not like jumped into it, but it’s just the producer asked me to do it. And the role that I played, I feel is pretty comfy for me. It’s more like a soldier in the past, like 300 years ago. It’s a fun thing to do. That’s the only one [film I did] and a lot of hard work, also, to do the movie. Would you do that again? It is a lot of waiting around on the set. Health supplements. There is my company called Magic Thai Herbs by Paradorn. It’s building men’s products. It’s a supplement which, you know, just makes your body feel good. It’s been running for six years now and it’s still running good. Men’s underwear: I know a friend from Sweden and we have a brand called FRIGO. I actually was not really thinking about doing men’s underwear, but at that time, I mean, why not? You know, if you want to do business you have to try everything. Make sure you’re not investing too much money on it and if you decide to invest, then you have to be ready to lose that money or to gain some money. I like that. Diverse portfolio. Finally, motorbiking. Motorbiking is something that I like a lot. Now I don’t do it anymore. I ran into accidents plenty of times, and finally I felt like, ‘Okay, I don’t think I want to hurt myself.’ And to find something to do, finally it’s come to golf. That’s why golf is pretty much in my life now. I see. It’s much safer.